2 – Volleyball Team Quotes – You’re Here! 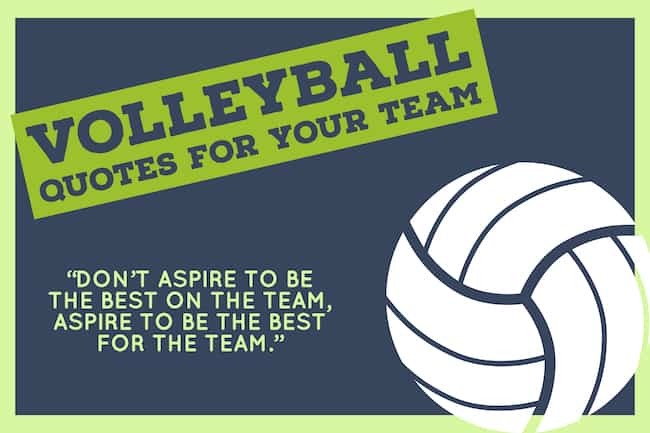 Excellent volleyball team quotes to help set the right tone for your squad. Like many team sports, volleyball depends on a group of players working as a unit, communicating effectively and being cohesive. It’s not all rainbows and ponies. If you don’t have any dreams, none of them will come true. Coaches are sales people and change agents. Great teams are defined by being able to just take care of their side of the net, and not worry about what is going on on the other side of the net. If you yell all the time, how do they know if you’re really angry? We don’t have to be great. We have to play good volleyball for extended periods of time. It’s a really interesting change that’s really forcing me to evolve as a coach, to keep growing and developing and trying to keep getting better. Practice is the battle you must win. To be great at the Olympic level, you can’t do it right 99 times out of 100. You MUST do it right 999 times out of 1000. Volleyball is one of the most interactive games going. It is a game of intuition, imagination, improvisation – but most of all, of reciprocity – of teamwork. There is no way to free-lance in volleyball. Don’t just beat them, make a lasting impression that makes them never want to see your face again. The will to win is more important than the skill to win. It is possible to achieve only what you actively pursue. Cogito, ergo sum. I think, therefore I am. Keep your head high and work hard every day, because you’ll never get that day back. Being a good teammate sometimes means sitting on the bench and cheering your heart out. As head coaches, we are perpetually dissatisfied. It’s a grind in the best possible way. It’s not a grind that wares you down. And, it’s a grind that polishes you. If you only got 60% on a certain day, you gotta give 100% of that 60%. If one of your athletes is only at 70% on a certain day, you have to do your job as a coach to get all 100%, not just his 70%. We had enough in the team’s emotional bank account, so they trusted us as a coaching staff when we asked them to do something different. I’m definitely looking forward to the Olympics. It is the culmination of a lot of work and a huge investment of time and energy. As we get to the end of the quad, I feel sort of bittersweet that it’s going to be over so quickly. I like our team. It’s been a great honor and privilege to coach this team. As we get to the Olympics, I’m going to stop and smell a rose or two and try to savor it, while concurrently working as hard as I can to be as successful. Coaching is about finding a system that works for your players. There are some underlying principles which are applied in any coaching situation but it’s about picking the lock to get this group of players to play the best volleyball they’re capable of playing for a long period of time. Check out Volleyball Court Dimensions. I’m not trying to set the bar high. We’re just trying to compete. We want to grind. This is what we do. That concerns me. You’re either getting better or you’re getting worse. I don’t think you stay the same in sports. If we want to achieve something special in the game, then these players have to recognize that they’re responsible every day for getting better. I’ve heard people say that maybe we’d be better served had we lost. I was kind of wondering what profession they were in. I wouldn’t want a lawyer representing me to think like that. And, I wouldn’t want a doctor operating on me to think like that.